Anniversary years always bring about some interesting new events, some are one offs, while some remain and build following impressive debuts. Personally I hope that the recent airshow at Headcorn turns out to be in the latter category. An early treat was a full display from the Kent Spitfire. Regular readers of this site will know that Headcorn is my local airfield and I have grown up visiting on a regular basis. 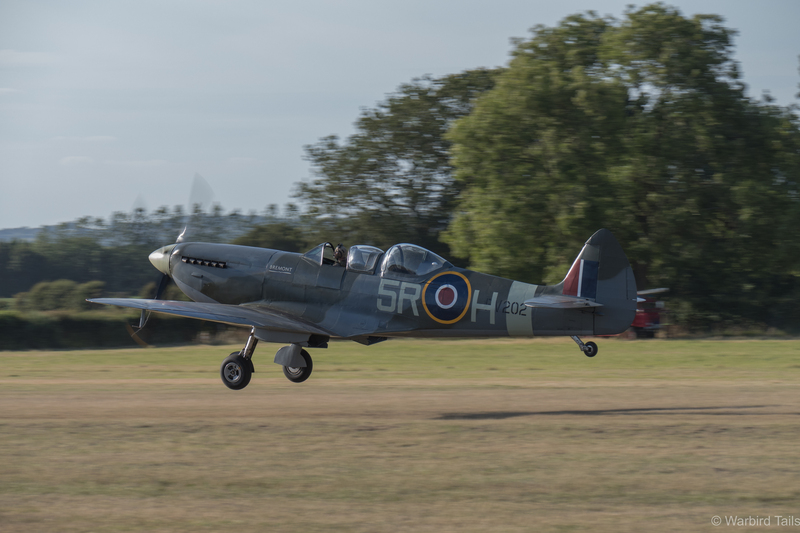 Over the years I have always hoped that an airshow may become a regular feature as the venue really is perfect; a small grass airfield, crowd line close to the runway and a picturesque backdrop of the Weald of Kent. Not to mention of course that the field has actual wartime history as an advanced landing ground in the lead up to D-Day. The Impressive line up of visiting aircraft. Watching the Blenheim fly out of Headcorn was a real highlight. 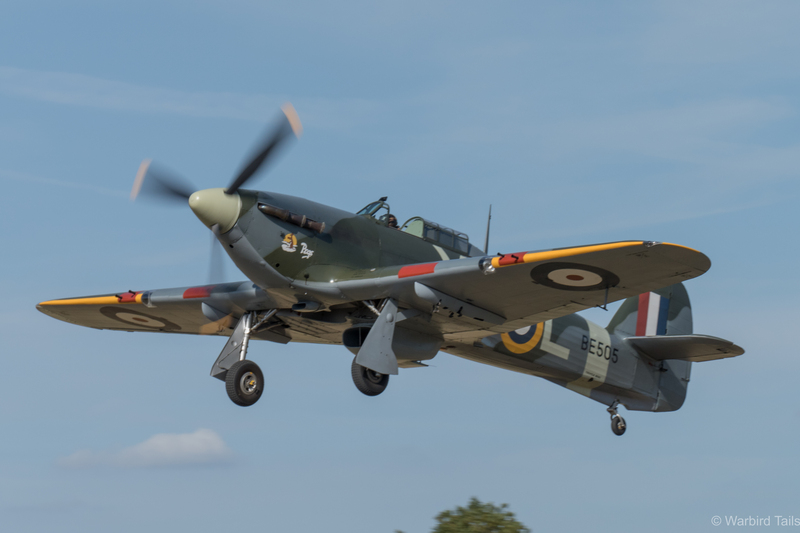 You can imagine my reaction then, when Aero Legends announced they would be hosting a Battle Of Britain Anniversary airshow at the airfield, with a number of Spitfires and Hurricanes planned to attend. As the date grew closer the list got even more impressive, the icing on the cake being the Bristol Blenheim. Headcorn always provides up-close views of taxiing aircraft. 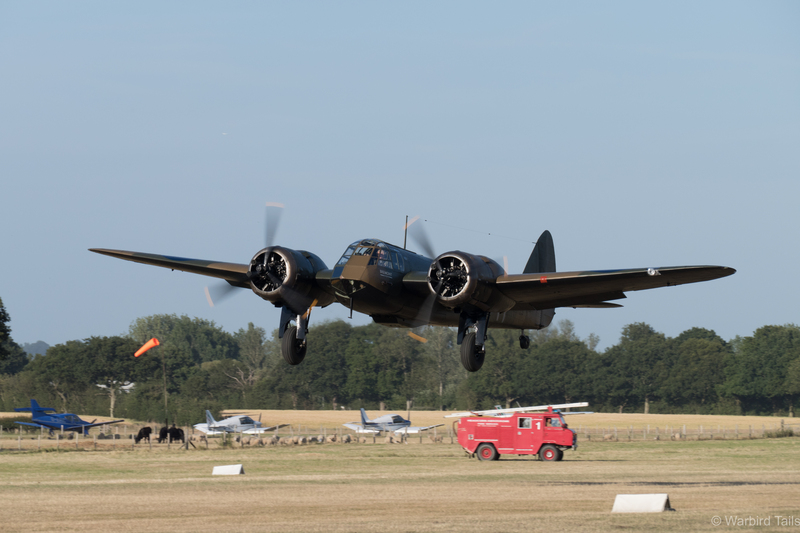 There was a lot of debate and frustration over the weekend which Aero Legends chose for this event, as it clashed with Duxford’s Flying Legends show. The reasons for choosing this weekend were certainly understandable. 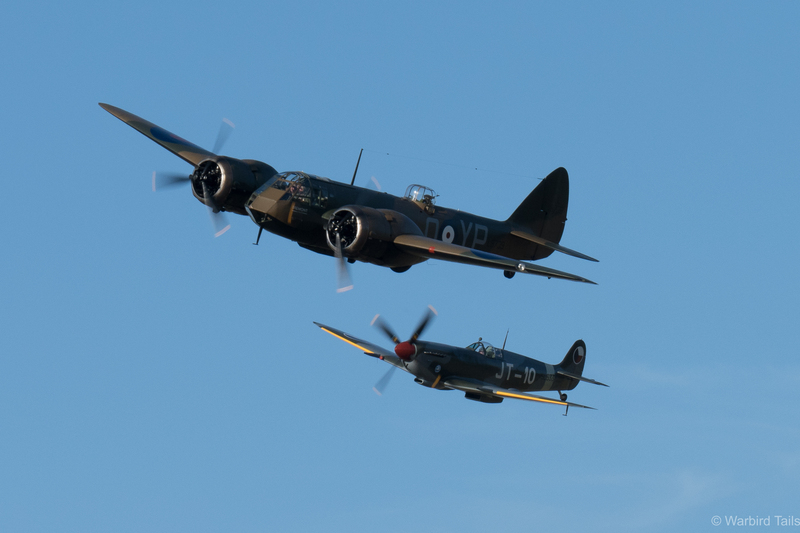 The day after the show would see a Battle Of Britain remembrance ceremony taking place at Capel-le-Ferne, this meant that a number of veterans from the battle would be in Kent the night before. The choice of date meant that this show could have the veterans in attendance, which was an important and poignant addition. There was high quality flying throughout the afternoon. 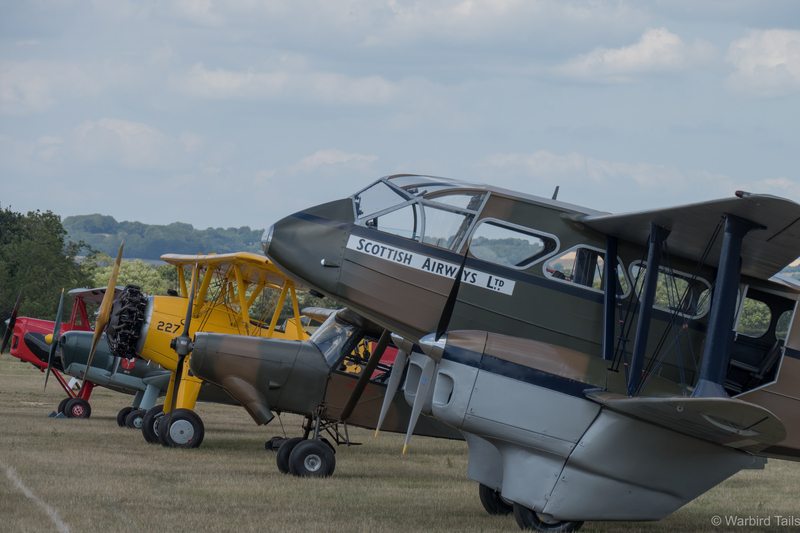 I elected to break my tradition with the weekend and spend the Saturday at Headcorn as that line up at my local airfield seemed far too good to pass up. There was also the promise of a relaxed atmosphere and some close up flying. Arriving at the airfield it was clear that the attendance hadn’t suffered due to the clashes in the calendar as only an hour after opening the overflow car park was already being prepared for use. It was great to see Headcorn so busy and the event management team seemed to have things covered well with traffic moving quickly and only small queues at the gate. A close up look at the BBMF fighters is a very rare opportunity. The main field was filled with just the right amount of displays, a small funfair occupied one end. There was a large patch of open grass surrounded by stalls, which left a good amount of space available for spectating. With everything being so close at Headcorn, standing a few rows back doesn’t make too much of a difference. The double edged sword of a small venue such as Headcorn, can be the restricted view from the front row caused by aircraft parking along the fence line. As this had been the set-up at previous shows on the airfield I expected the same again, in reality the area normally reserved for the based GA aircraft was utilized, meaning that the static aircraft could be seen lined up by wandering over towards the museum end of the airfield. A classic line up of trainers. While on the subject, the Lashenden Air Warfare Museum is always worth a visit and was completely packed on the show day, the museum also had their piloted V1 flying bomb out on display, a rare sight while they try to raise funds for a permanent display space. The museum’s Fi 103 Reichenberg – The piloted V1. Headcorn is always a busy circuit with plenty of based aircraft, parachuting and helicopter flying. Adding to the mix during the morning were regular pleasure flights from a Dragon Rapide, Jackaroo and a number of Tiger Moths, all of which seemed to be doing good trade. 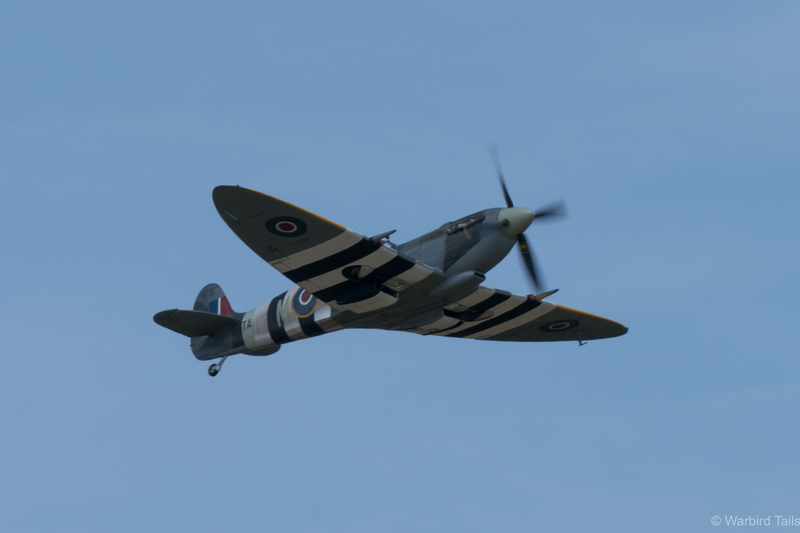 The flying wasn’t billed to start properly until 4pm, so it was a great surprise when the Kent Spitfire came diving in for a full display around Midday, with Dan Grittiths putting in his usual breathtaking routine. There were intermitent arrivals throughout the early afternoon for the show, with the brightest moment being the arrival of the BBMF. Some of you may have seen my recent post regarding the Memorial Flight’s first visit to Headcorn back in May, the novelty certainly hasn’t worn off and this time there were four fighters to count in. 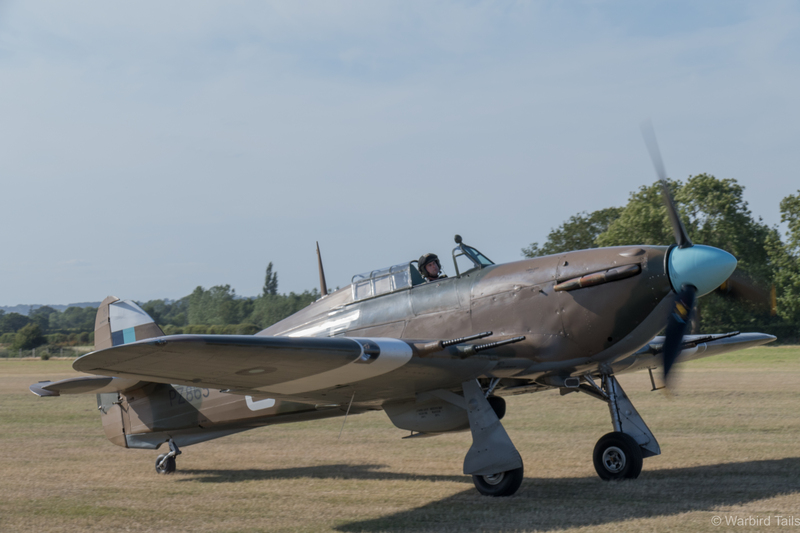 This could be a scene straight out of 1940, Spitfire P7350 taxies in while Hurricane LF363 rolls out behind. 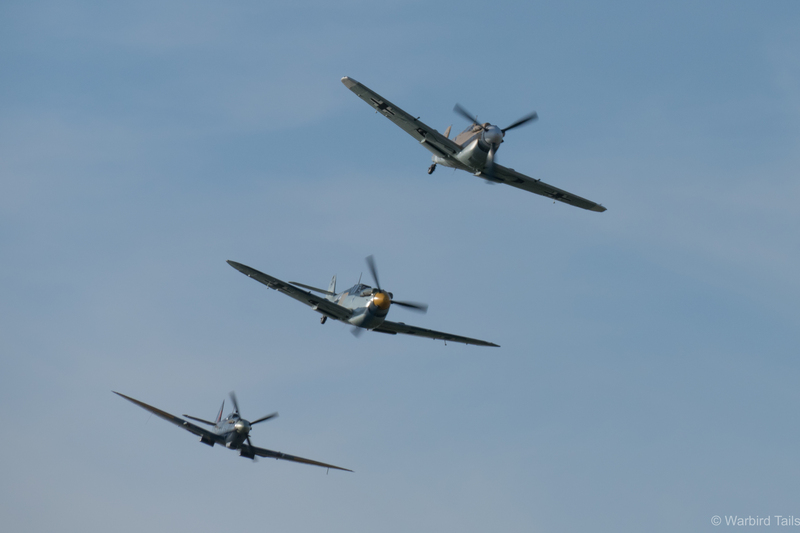 Performing a short display before landing were both of the flights Hurricanes, joined Spitfires AB910 and P7350. These aircraft are rarely seen landing on at shows and certainly rarely seen on grass, so getting the chance to see them operate so close was a real highlight of the day. AB910 touches down on the grass. On to the main show now, which, as mentioned above began at 4 o’clock. 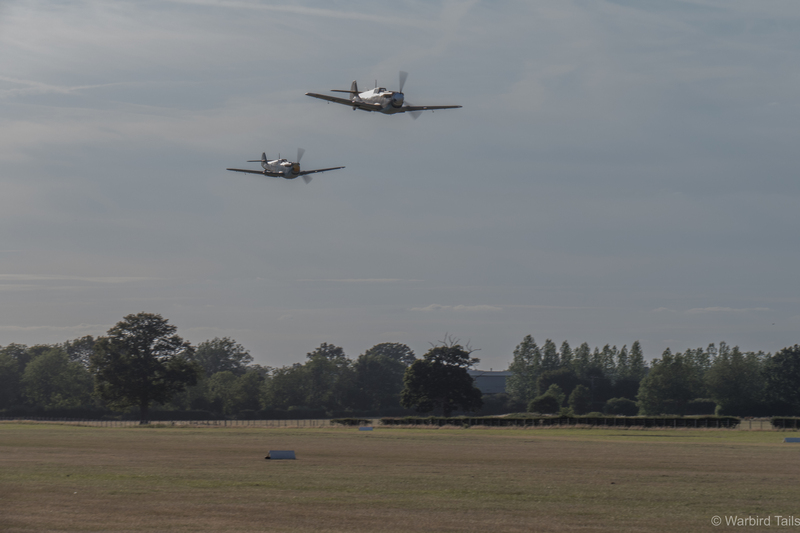 The first act up were a pair of T6 Texans/Harvards from the Aircraft Restoration Company and Radial Displays. Harvards are often overlooked these days at airshows so it was refreshing to see a pairs display from the classic trainers. The camouflage machine was a particular highlight, as it is the first time I have seen in display. A great bit of flying to start the day from John Dodd and Richie Piper. 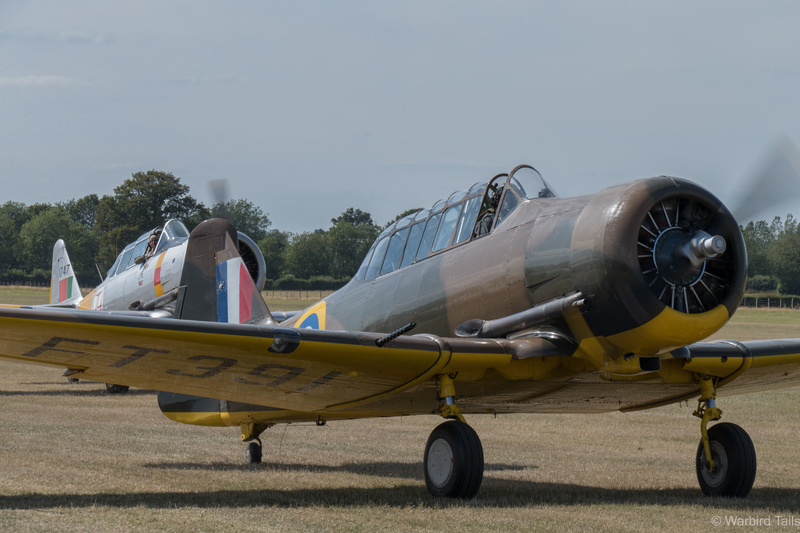 The pair of Harvards taxy back after their display. It was then time for the “home team” to display one of their machines. 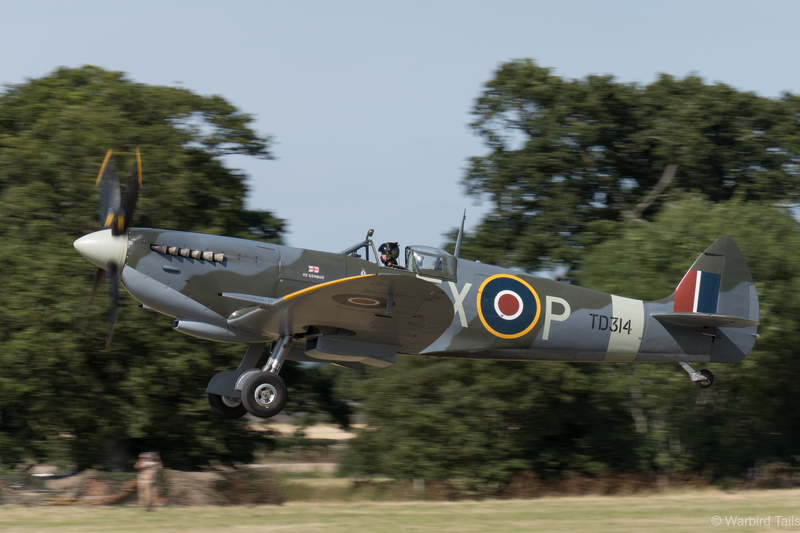 Aero Legends’ flagship aircraft is Spitfire Mk IX TD314, which got jumped into the clear summer afternoon, with the Battle Of Britain Memorial Flight’s Anthony Parkinson at the controls. This display was a fitting contrast to the earlier show from the Kent Spitfire, which was a very aggressive display which showed off the power of the Spitfire. “Parky” flew a very graceful solo routine, very different from those we are used to seeing with the BBMF aircraft. A lyrical combination of loops rolls and derry turns, all while keeping reasonably low. TD314 gets airborne for the first flight of the day. 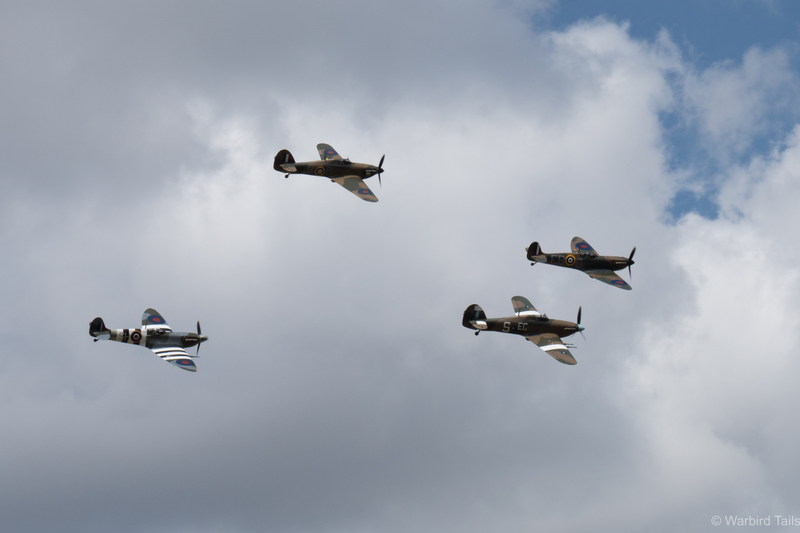 The Spitfire display was followed by a complete surprise and an unexpected highlight, the de Havilland formation. Leading this tribute was David and Mark Miller’s Dragon Rapide, visiting from Duxford. 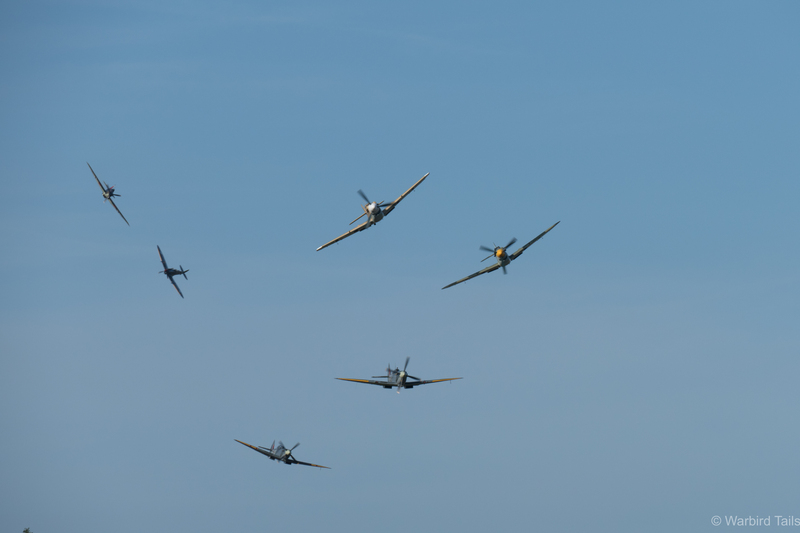 The de Havilland tribute formation. 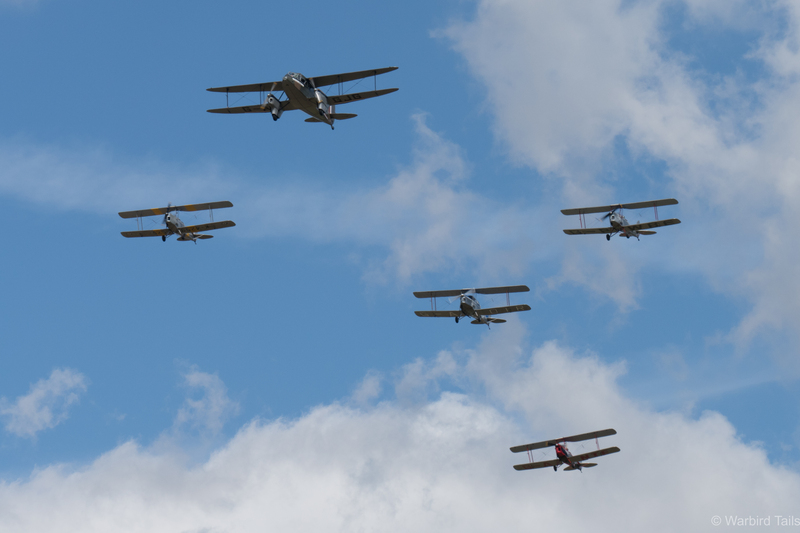 The Rapide led three Tiger Moths and the Jackaroo in a series of passes and turns, this formation took a little while to set up but was well worth the wait. I certainly wasn’t expecting it and it made for a wonderful tribute to the 30s designs. 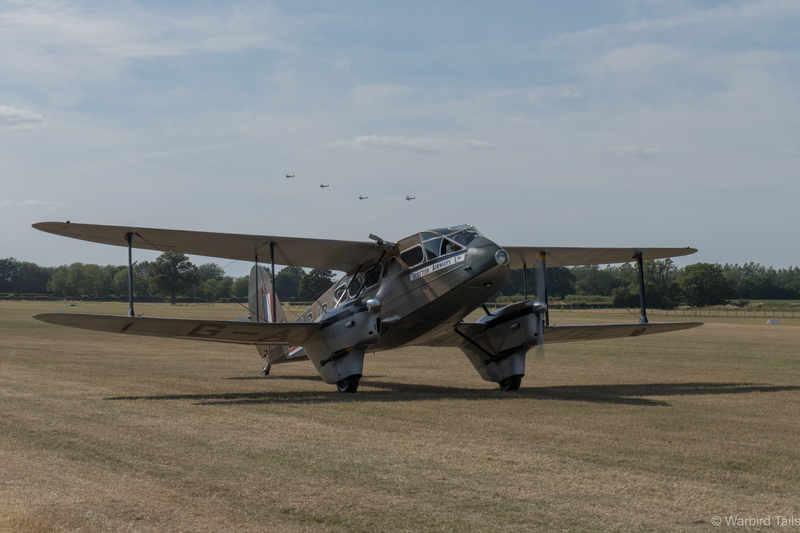 Following the formation the Rapide put in an energetic solo routine before landing on as the Moths performed a graceful low level tail chase overhead. The Rapide taxies back as the four Moths pass overhead. Up next it was time for Peter Teichman to take to the stage in his beautiful Mk IIb Hurricane “Pegs”. 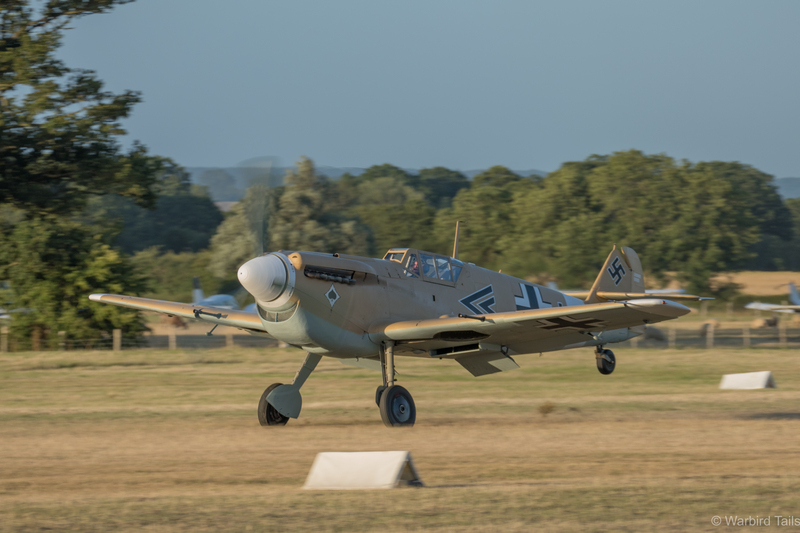 Peter put in his usual polished routine looping and swooping all over the airfield displaying this classic fighter in an energetic way that few others on the circuit seem to achieve. Its always a thrill to see the Hangar 11 aircraft up close. 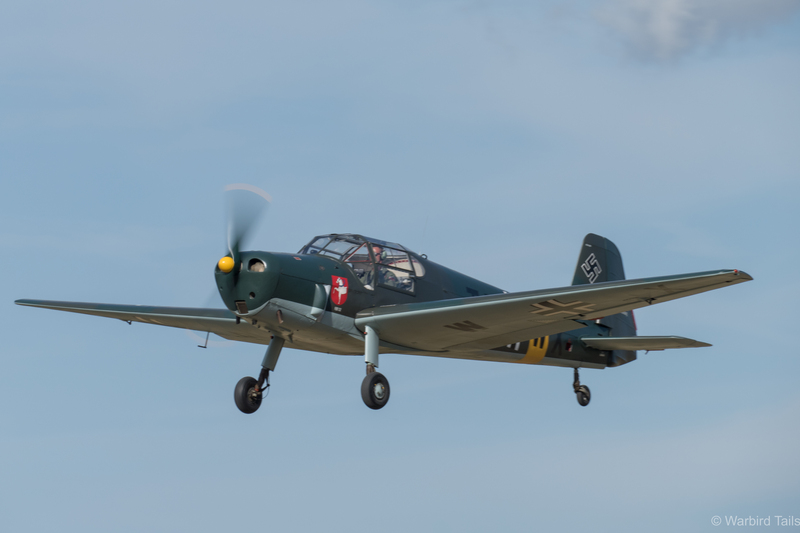 The “Luftwaffe” of the display made its first appearance with the Bucker Bu181 Bestmann, flown by Jonathan Wilkins. Another machine I haven’t seen display that much so it was good to see it being flown in a very energetic manner at airfield and fitted very well with the theme. The Bestmann during its display. Chasing the enemy away was the return of the Battle Of Britain Memorial Flight, crosswind conditions meant the Spitfires couldn’t be flown, which caused concern amongst some spectators. I was too busy admiring the fact that the BBMF were putting up both there Hurricanes for a very rare pairs display. I certainly can’t think of any other occasion where this display has been performed. The two fighters performed in formation before breaking into a short tailchase in the evening light. 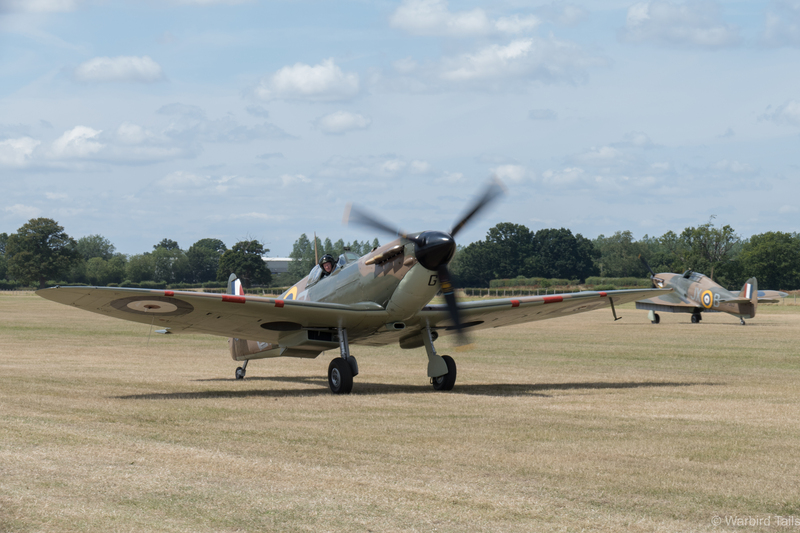 This also gave the opportunity to watch the Hurricanes land and taxi in again on Headcorn’s grass runway. The mixed formation gets airborne. Once again the training aircraft on display provided another highlight. 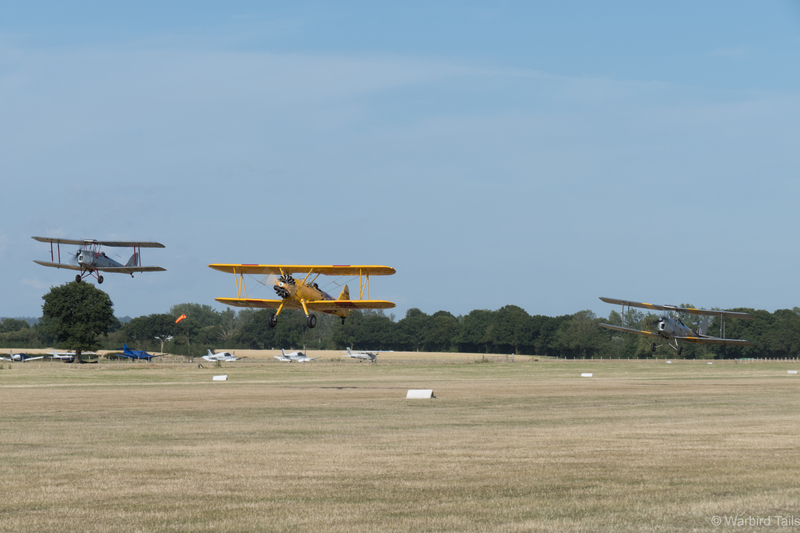 Taking off in formation were two Tiger Moths led by a Stearman, certainly not a combination I’ve seen before! 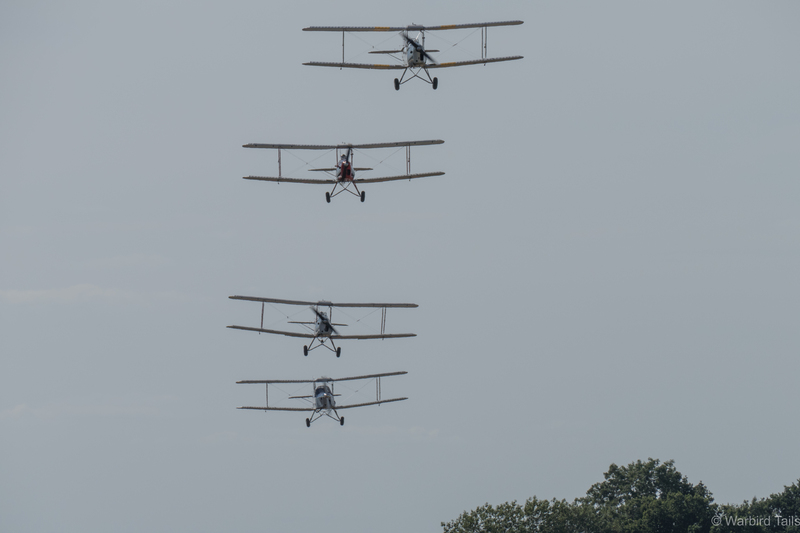 The three machines circled around in loose formation before the Tiger Moths performed a low level pairs routine as Rob Davies performed aerobatics at higher level. The Stearman display was unlike any I’ve seen before with the plenty of low level stall turns loops and rolls. 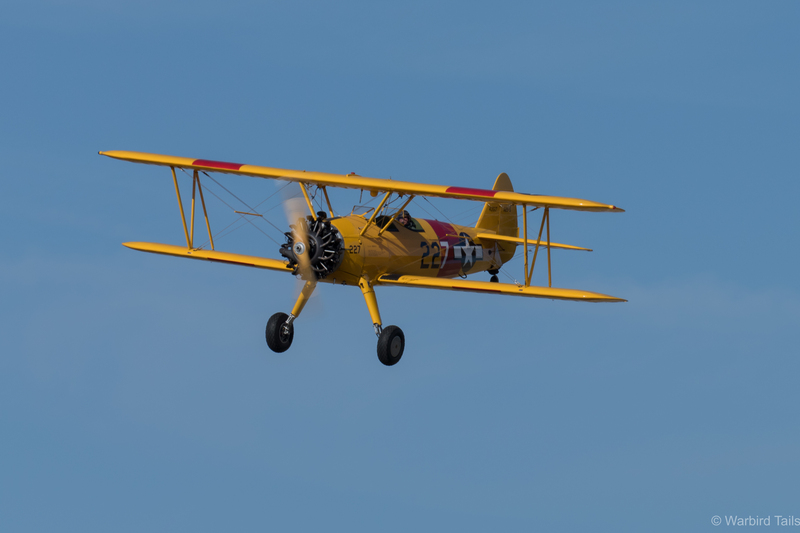 Rob Davies during an impressive display in the Stearman. In the brief break that followed the trainers display you could now feel the excitement building as the finale of the entire show was approaching. This brief pause in proceedings only served to heighten the anticipation for the arrival of the star performer. John Romain bringing the Blenheim round for a pass. Only a few minutes after the Stearman landed a familiar shape appeared over Headcorn village and it was announced that John Romain had requested an earlier slot in the Blenheim. It was 6 o’clock now and the light was just perfect for this classic machine. 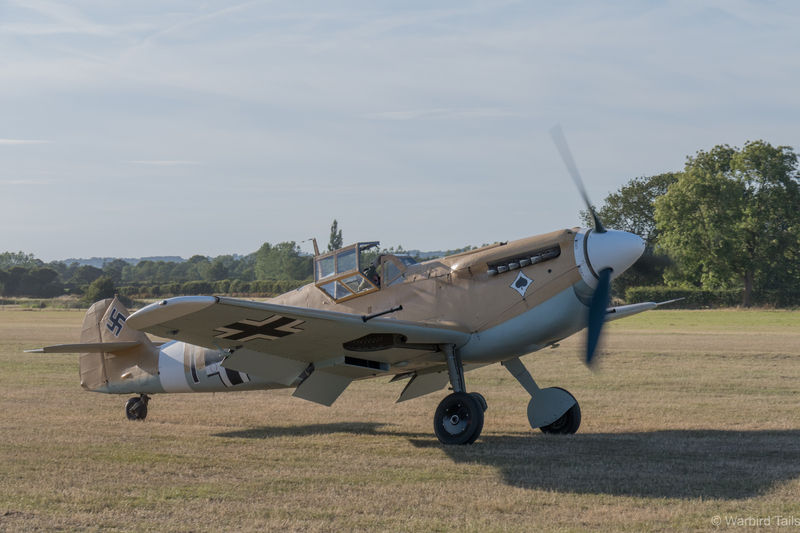 There have been plenty of comments about John Romain’s superb flying in this machine and Headcorn really suited the routine. 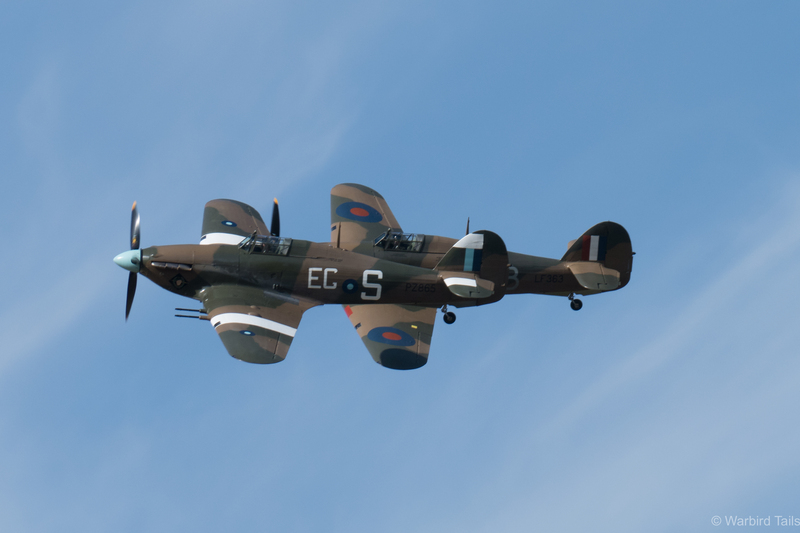 Then the perfect moment, for me at least, came as the Blenheim lowered its undercarriage and joined downwind. Never in a million years did I think I would see the Blenheim anywhere near Headcorn, let alone on short finals. Watching in partial disbelief as the twin engined fighter taxied back along the fence line in the fading light. Superb. 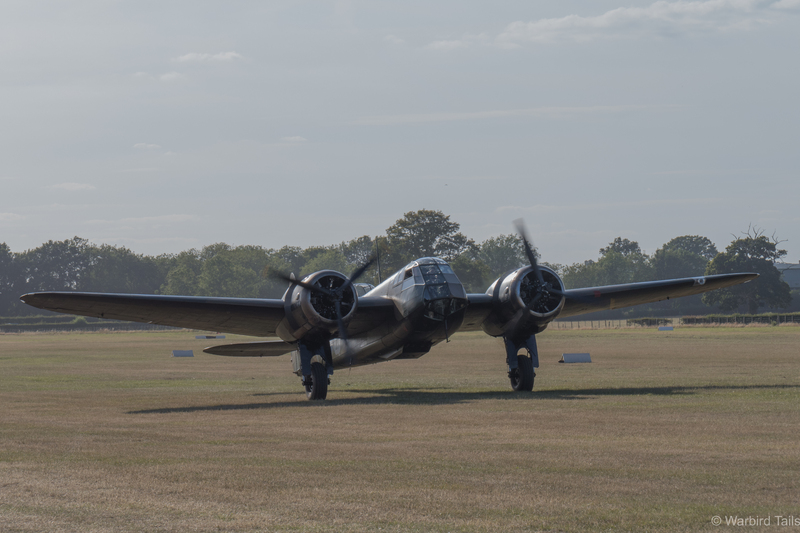 The Blenheim taxiing back after its display. Even after one of the best display acts of this year, the show wasn’t anywhere near finished yet! Not long after the Blenheim arrived two Spitfires, PV202 and TD314 were at the holding point, joined by the Vacher Hurricane, the three British fighters launched to avoid the incoming German attack. The three fighters performed lazy eights over the field as they waited for the enemy to arrive. PV202 taking off ready for the battle finale. Leaving the airfield for a moment the fighters gave way to some impressive pyrotechnics, simulating a bombing attack over the airfield, which soon gave way to a simply stunning arrival from two Buchons from Duxford, both of which came tearing down the runway at low level, with strafing pyrotechnics ahead of them. The two “109s” followed each other through some loose formation aerobatics and impressive low passes before the inevitable happened, the British aircraft got on their tail. 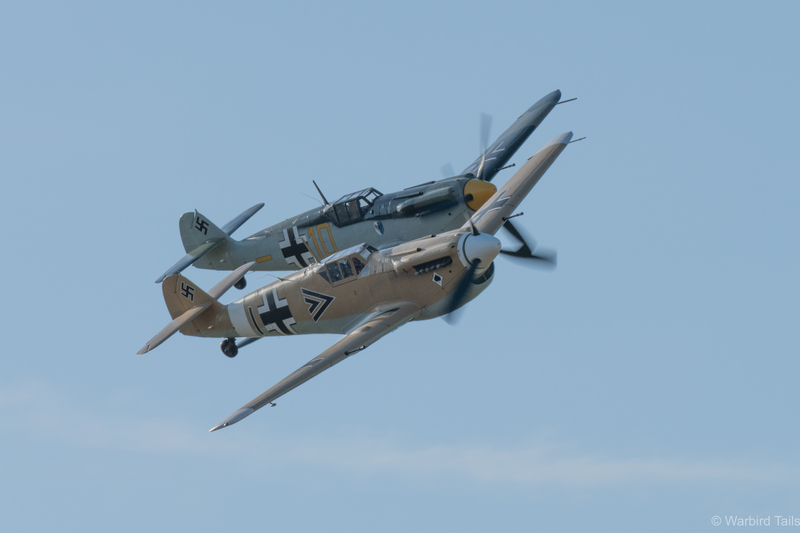 The two 109s showed off their usual close formation routine. Joining the 109s on the flight down from Duxford was another big coup for the show. 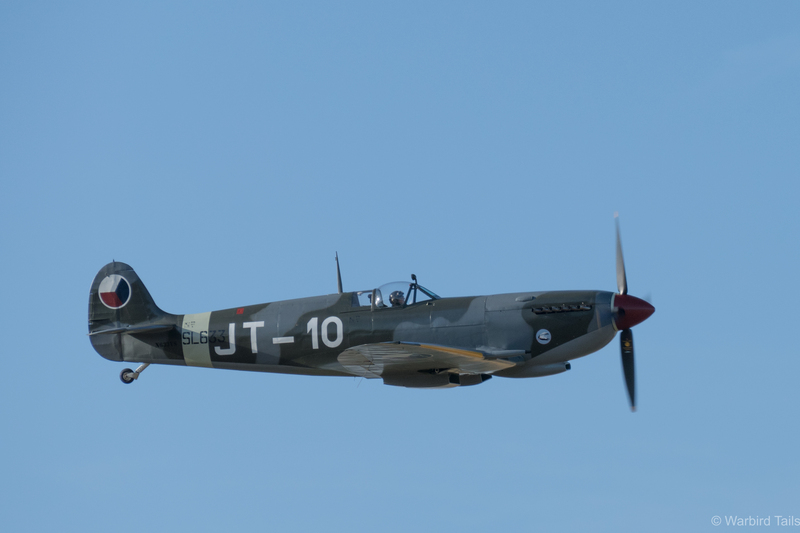 Spitfire IX SL633 is on tour in the UK until September for the 75th Anniversary, having been shipped across the atlantic from America. Headcorn managed to secure the booking of this machine for its debut solo display in this country. 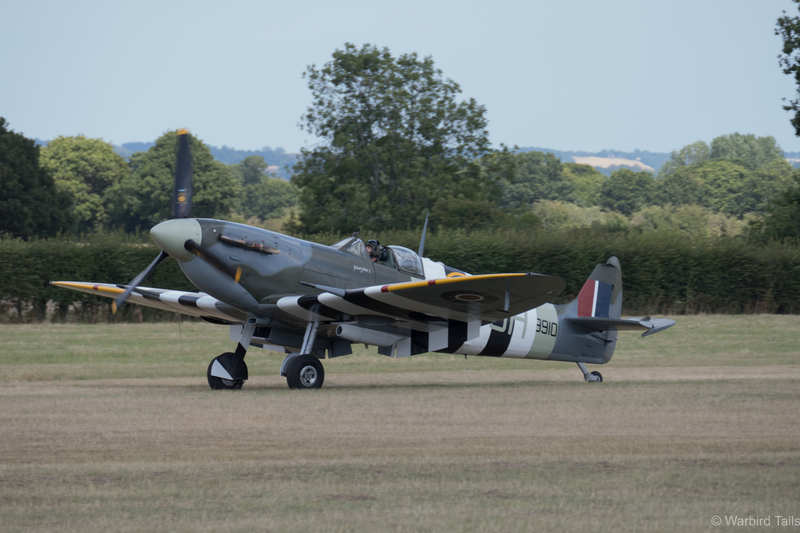 ‘633 had only arrived in a container a week before the show and it was great to see it being put through its paces in our third solo Spitfire display of the day. SL633, on debut from America. Once the allies got on the back of the 109s a superb tailchase began. Close into the crowd, plenty of noise and mixed types tearing around Headcorn for an extended routine, the noise alone was incredible. The tailchase will go down as one of the most memorable sights at Headcorn I’m sure. Eventually, and perhaps inevitably, the Germans were defeated and the fighters cleared away to the hold. 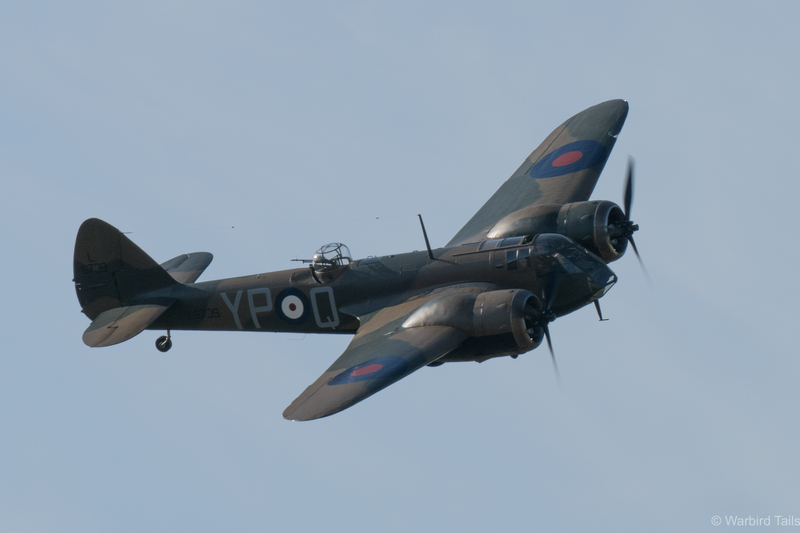 As they did so, and SL633 finished its solo routine, the Blenheim got airborne again for its flight back to Duxford. Rather than clearing, as I expected, the Blenheim flew to the south and joined up with the Sptifire for two formation passes. What an unexpected treat! An unexpected bonus late in the day! The two Spitfires, Buchons and Hurricane returned for a formation pass, before the Spitfires and Buchons performed a run and break to land. With that a superb evening of flying came to a close. The airfield stayed open and I stayed sitting in the field enjoying the summers evening and sunset, soon rudely interrupted by a glorious sunset departure from both Buchons. 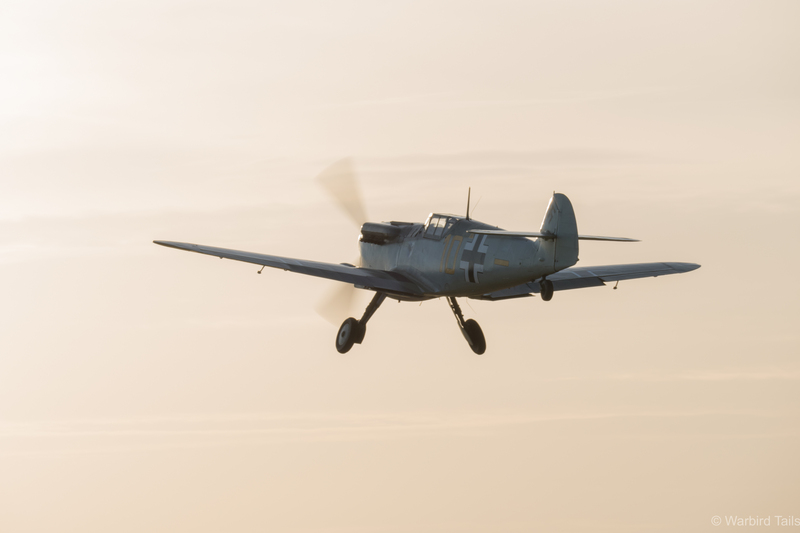 Buchon departing for Duxford in the late evening. The finale to the day was watching “Parky” put on another display at 9 o’clock, not long before dark. 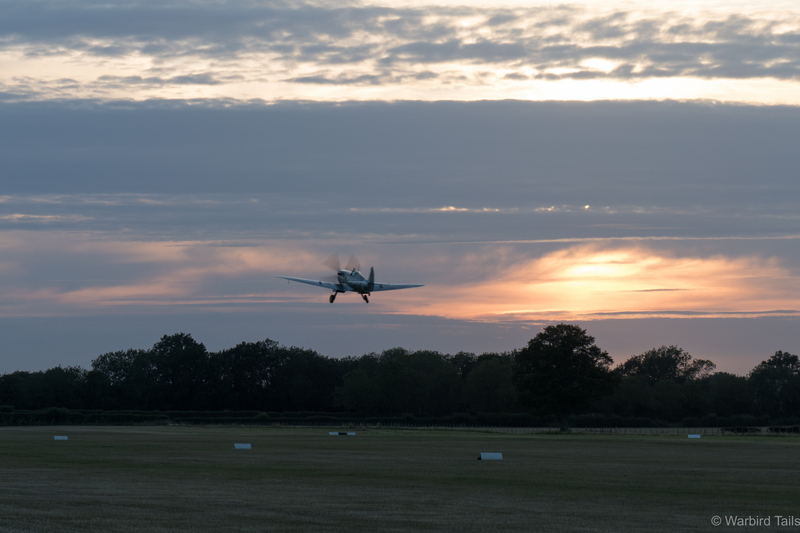 Departing to display at Leeds Castle “Parky” returned just before dark, there is always something incredible about watching a Spitfire land at dusk, a fitting close to a great day. Parky gets airborne for the final flight of the day. Overall, while there is some room for improvement, such as the information coming out of the commentary team as to what was coming up and going on. I would love to see the flying display expanded next year, allowing some warbirds from other aspects of the war. The show was a superb first outing and the attendance didn’t seem as affected as I expected by the clash with Duxford and Yeovilton either. It must be encouraging for the organisers to think what could be achieved if this show moves to an empty weekend in the calendar. I look forward to next year!